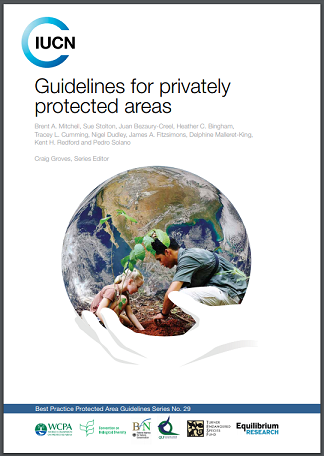 These guidelines, prepared by the Privately Protected Areas and Nature Stewardship Specialist Group of the IUCN World Commission on Protected Areas, offer a range of best practices for establishing PPAs and securing effective longterm conservation on private properties. They offer specific guidance applicable to areas under private governance and management, including appropriate legal and institutional arrangements and useful insights into funding mechanisms. These guidelines discuss different options and instruments for establishing and managing PPAs, drawing on a diversity of PPAs from around the world. It is hoped that practitioners will draw on and contribute further to these best practices, enriching the suite of examples and inspiring new application of the principles and guidance.